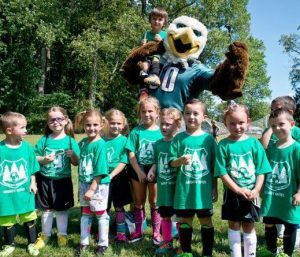 O ur Mighty Mites program is unique in our area, and is designed as an introduction to soccer for boys and girls ages of 5 to 7. We practice and play Friday nights under the lights from 6:00 PM to 7:30 PM from late August to November. The focus at this age is to introduce the kids to the game, and let them have as much fun as possible. 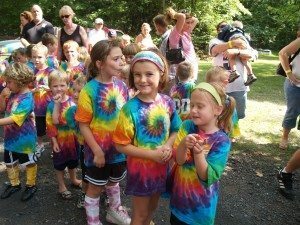 Registration is in August before each fall season. Registration dates for 2018 are Sunday, July 29th from 3-5pm and August 5th from 3-5pm in the Ratskeller. The cost this year is $85.00 per child if registered by August 15th. Any registration after the 16th, the cost will be $100.00. Please bring cash or a check to pay for registration. All consent forms must be signed in our presence when you register. If you are interested/willing to be a coach, assistant coach or team parent, please let us know when you register. The cost includes 2 shirts-a practice jersey and a game shirt, (1) coupon for a wristband for unlimited access to the kiddie center at Oktoberfest, ref fees and Banquet on the last night which includes: pizza, ice cream, soda and player awards. There are no registrations after August 24th or at the field. If you are unable to make either of the registration dates, please call Toni Kehan at 215-675-9546 to make other arrangements. Friday, August 31st is our first night. The last night is November 16th, (on this night, there will be no practice, just the game followed by the Banquet). For your convenience, the registration form is below for you to fill out in advance and bring with you when you register. No registrations will be accepted by mail. We will also have forms at registration for those who need them. We are unable to accept any special requests for team or coach preferences.